In the ongoing skirmishes between salmon farmers and environmental groups, fish farmers appear to have a powerful ally in the provincial government, says Wilderness Committee campaigner Torrance Coste. A Wilderness Committee freedom-of-information request to the provincial Agriculture Ministry, asking for information on disease outbreaks on salmon farms between 2010 and 2012, produced 300 pages of emails and memos, many documenting communications strategies after diseases are discovered on farms. Emails from Gary Marty, ministry fish pathologist at the Animal Health Centre, ask company veterinarians for the go-ahead to release specific information about the outbreaks to media. “May I have permission to disclose information from the medical records about the two Mainstream outbreaks,” says an email from Marty to Mainstream Canada veterinarian Peter McKenzie. “If you want to provide partial permission, let me know and I can work around that. Otherwise, I will stick to information provided in the press releases.” “I believe the release serves as good evidence of a very concerning relationship between the Ministry of Agriculture, who are supposed to be a neutral monitoring and oversight body, and the fish farming industry,” Coste said of the information found in the FOI. However, Mary Ellen Walling, B.C. Salmon Farmers Association executive director, said the documents show a good working relationship between the industry and government, especially after infectious haematopoietic necrosis (IHN) was discovered at Grieg Seafood and Mainstream Canada farms. “I think those pages show a good level of co-operation, a high level of transparency and a lot of public outreach,” she said. Coste, referring to the email from Marty, said he finds it alarming that ministry staff are asking for permission before releasing information that should be public. 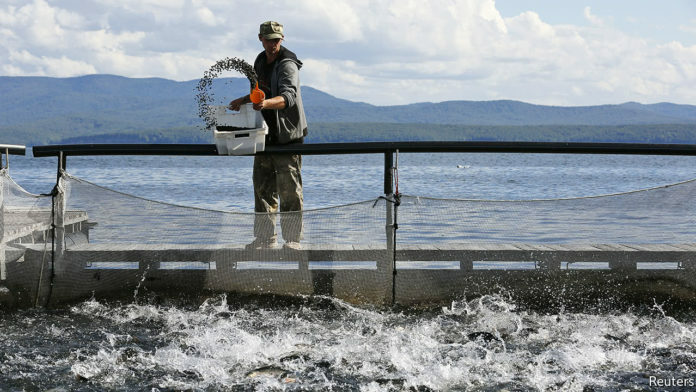 “This information pertains to disease outbreaks on private, open-net fish farms located in the ocean environment — a public entity,” he said. IHN, which is endemic in wild Pacific salmon but does not make them sick, can kill Atlantic salmon. Fisheries and Oceans Canada is responsible for overall regulation of salmon farms. “The [agriculture] ministry has no statutory authority to compel samples from fish farms for diagnostic analysis. All submissions from the farms for diagnostic testing are voluntary,” says the ministry statement.